Right that's it as the final whistle goes. Bournemouth deserved winners as Southampton lose a second in a row with a disappointing performance. You can follow reaction to tonight's games here. There will be four minutes of added time. Based on the previous 90, I can't see any sort of remarkable comeback. 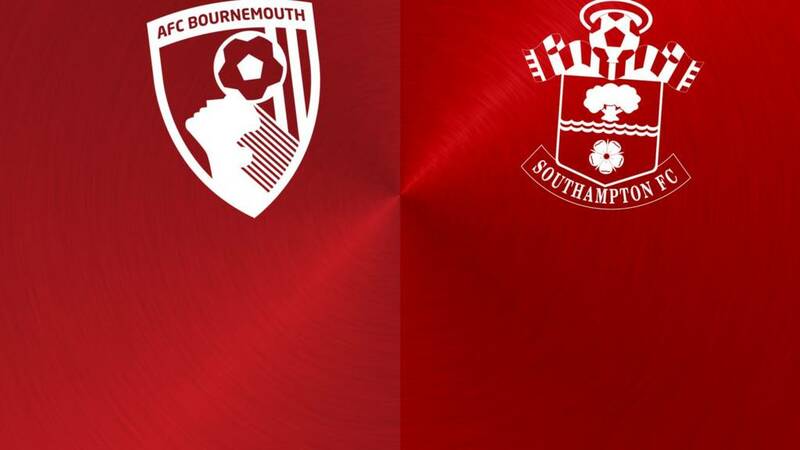 Cherries keeper Artur Boruc hasn't had much to do tonight but he comes out quickly to block at the feet of Southampton forward Sadio Mane as the visitors create a rare chance. BBC Sport's Mark Mitchener at Vitality Stadium: "Southampton right-back Cedric Soares won't be putting assistant referee John Brooks on his Christmas card list, as for the second time this half Brooks flags for a foul on Max Gradel and Soares gives him an earful. "It's Gradel's last act as he leaves to a standing ovation, having covered every blade of grass down the Cherries' left side in only his second game back from a serious knee ligament injury." BBC Sport's Mark Mitchener at Vitality Stadium: "Bournemouth erupts as for the second time tonight, a wicked free-kick from Matt Ritchie causes problems in the Saints defence, and Benik Afobe beats England keeper Fraser Forster to the ball to head home his fourth Premier League goal. "The home fans are singing Afobe's name - and a handful of Saints fans are walking out, perhaps mindful of the A338 roadworks on their journey home through the New Forest." That'll settle a few nerves. Matt Ritchie swings in a dangerous free-kick and Afobe gets on the end of it at the near post to send in a header. BBC Sport's Mark Mitchener at Vitality Stadium: "Signs of nerves from Bournemouth on the pitch, which is spreading to their supporters. "They've only won three home games all season before today - and they won't need reminding how they top the Premier League table of 'most points thrown away from winning positions'. Stand by for a tense last 15 minutes." Bournemouth are dropping back now as they protect their lead. Can they hold on? BBC Sport's Mark Mitchener at Vitality Stadium: "A last throw of the dice from Ronald Koeman with 20 minutes left as Shane Long goes off - the second of Southampton's three forwards to be replaced. "Koeman then has two or three goes at kicking an errant plastic bag - in Saints-style red and white stripes - away from the technical area. Bournemouth, meanwhile, take a deep breath and soak up some pressure." Joshua King played after becoming a father this morning and the Bournemouth striker's evening comes to an end as he is replaced by Lewis Grabban. Can we have some football now please? It's all got a bit scrappy. Those injuries and substitutions have interrupted the flow of the game and, on that note, we've got another substitution as Dusan Tadic comes on for Shane Long. It's injuries-o-clock here. Bournemouth midfielder Harry Arter signals to the bench he needs to go off and Dan Gosling comes on. BBC Sport's Mark Mitchener at Vitality Stadium: "'Charlie Austin, he's injured again' is the rather harsh chant from the Bournemouth fans - who so nearly had Austin playing for them in 2009 - as the big striker departs to be replaced by the rather more fleet-footed Graziano Pelle. "Meanwhile, Saints' Shane Long and Bournemouth's Steve Cook both challenge for the ball - and both need a visit from the physio." Graziano Pelle immediately gets involved in the action as he cushions a header for fellow striker Shane Long. He misses the ball with his attempted shot and, instead, kicks Steve Cook, who intercepts. Southampton striker Charlie Austin limps off and Graziano Pelle comes on in his place. BBC Sport's Mark Mitchener at Vitality Stadium: "After a muted end to the first half following the injury to fourth official Kevin Friend, both sides are finding their feet again. "Southampton have just won their first corner, compared to Bournemouth's nine - but the possession stats are exactly level. Steven Davis is seeing plenty of the ball as that early substitution seems to be working for Saints." Southampton win their first corner of the game and Andrew Surman heads away Ryan Bertrand's delivery at the near post. The visitors are looking a little more dangerous than the first half but not much. The home side are carrying from where they left off as they put the Southampton defence under pressure.